Nutsedge is often referred to as nutgrass. 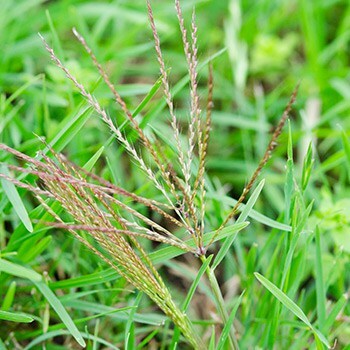 Along with dallisgrass, nutsedge control is one of the most difficult weeds we see in the landscaping and lawn care industry. This weed will produce thorny burrs among its leaves. Once established, this weed is very hard to purge from a lawn. In most cases, a pre-emergent will not prevent nutsedge. However, good cultural practice can help prevent its spread and infestation. This weed tends to thrive in moist conditions. Limit excessive watering, check irrigation pipes and sprinkler heads for leaks and install subsurface drainage if necessary. Be very careful when adding compost or sandy topsoil to your lawn or landscape. There are types of unfinished composts and sands that contain nutsedge seeds. The Weedex residential lawn care program includes spot treatment of summer grassy weeds with our regular applications. However, if nutsedge persists it may require separate applications with products designed specifically for nutsedge control. A minimum of two applications will be required between 4-6 weeks apart. If a third treatment is required it will be completed at no charge. Additional information regarding nutsedge control can be read here. Expected results from nutsedge specific applications are up to 80% control for the current year. These applications are most effective from late spring to late summer. Eradicating nutsedge from a lawn is a process that may require repeated applications over the course of a few years.